View full sizePortland Fire RescueThe fire at this North Portland home Friday evening killed a 41-year-old man.The man killed in a fire Friday night in a North Portland home that included a marijuana growing operation was Jason Ross Brown, 41, Portland fire investigators said this evening. 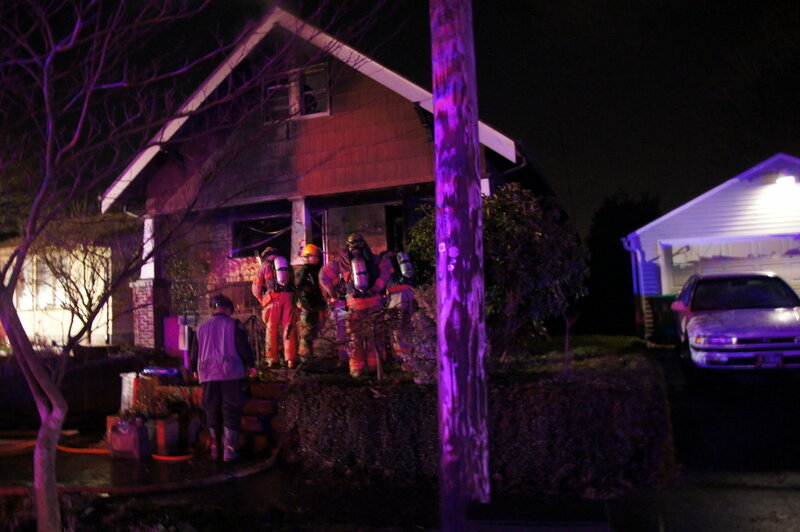 Brown was a valid medical marijuana card holder but the growing operation in the two-story house at 6219 N. Concord Ave was in excess of what he was allowed to legally grow and possess, Portland Fire Rescue investigators said. He died of carbon monoxide poisoning as a result of the fire. The fire appears to have started in the basement, but investigators have yet to determine if it was related to the growing operation. They estimate damage to the home at $225,000. A neighbor told The Oregonian Friday that Ross was a renter who said he grew medical marijuana for cancer patients. That’s an area where patients can inhale marijuana while avoiding the irritating and potentially cancerous effects of smoking. The facility’s operator, Wellness Connection of Maine initially planned to feature such a lounge. After state officials raised concerns, Wellness of Maine changed its plans. PORTLAND, Maine — The operators of a medical marijuana dispensary scheduled to open in Portland say they will not have a “vapor lounge” at the site after state officials raised concerns. A “vapor lounge” is an area where patients can inhale the medicinal compounds while avoiding the irritating and carcinogenic effects of smoking. Wellness Connection of Maine said on its website this month that it planned to include the lounge at its facility expected to open in February. John Thiele, program manager for the Maine Medical Use of Marijuana Program, said those plans ran afoul of state regulations and he was concerned the dispensary would become a hangout. Rebecca DeKeuster of Wellness Connection tells The Portland Press Herald (http://bit.ly/sH7ef5) that after talking to state officials, the company has amended its plans. If you were designing a facility to dispense a substance that has recently been legalized for medical use in your state, how would you do it? The legalization of this substance is a highly controversial, fraught issue, and much of the opposition to its legalization for medical use revolves around questions of how legitimately it can be used as medicine in the first place, and attendant concerns that so-called “medical use” is just a ruse to cover for recreational consumption. Indeed, though the substance has been legalized in your state, it is still illegal from a federal perspective. With all that in mind, what kind of space would you create for distributing this tenuously-legal substance? HALLOWELL — A city medical marijuana dispensary started seeing patients by appointment before Christmas and plans to open full time next month. Wellness Connection of Maine’s 2,400-square-foot dispensary, one floor above the Liberal Cup on Water Street, is scheduled to open by January’s end, according to the firm’s executive director, Becky DeKeuster. Under state law, the dispensary will be the only one allowed in Kennebec County. Earlier this year, DeKeuster had hoped the dispensary would be open by the fall. Renovations have held up the Hallowell dispensary’s opening, according to Jane Lane, senior vice president with Philip W. Johnston Associates, a Boston-based public affairs firm working with Wellness Connection. DeKeuster said Wednesday that renovations are “pretty well finished,” with a few finishing touches remaining. “It’s a very beautiful and serviceable location,” DeKeuster said. The location has a parking area off Dummers Lane, with a winding handicapped-accessible ramp leading to a unmarked door with a keypad lock and a security camera overhead. Inside is a tidy, mostly empty space, with orange walls and a hardwood floor. DeKeuster said she didn’t have an estimate of the number of patients who have already been seen. To receive medical marijuana, patients must have one of many state-approved qualifying conditions and get a recommendation from a doctor. PORTLAND, Maine (AP) — A state health official says plans by the operators of a medical marijuana dispensary scheduled to open in Portland next month to include a coffee bar, acupuncture clinic and “vapor lounge” at the facility run afoul of state rules. He tells The Portland Press Herald (http://bit.ly/vfodRR) creating a social setting for the dispensation of medical marijuana is unhealthy because it promotes more marijuana use than is medically necessary. The operator, Wellness Connection of Maine, could not be reached for comment. Their two other dispensaries in Maine do not have the same amenities. PORTLAND, Maine (AP) — A state health official said plans by the operators of a medical marijuana dispensary scheduled to open in Portland next month to include a coffee bar, acupuncture clinic and “vapor lounge” at the facility run afoul of state rules. John Thiele of the Health and Human Services Department said a dispensary with such amenities would violate state regulations aimed at ensuring that dispensaries are places to get medicine for serious illnesses, not places to “hang out.” He told the Portland Press Herald creating a social setting for the dispensation of medical marijuana is unhealthy because it promotes more marijuana use than is medically necessary. PORTLAND — A medical marijuana dispensary that’s scheduled to open in Portland next month is designed as a California-style wellness center. The manager of Maine’s medical marijuana program says a dispensary with such amenities would violate state regulations aimed at ensuring that dispensaries are places to get medicine for serious illnesses, not places to socialize. Creating a social setting for the dispensation of medical marijuana is unhealthy because it promotes more marijuana use than is medically necessary and puts users and the public at risk if customers drive home under the influence, said John Thiele of Maine’s Department of Health and Human Services. In California, which also allows marijuana to be distributed for medical purposes, many dispensaries have become popular hangouts, he said, and that’s one reason why California has run into problems with the federal government, which considers all marijuana use illegal. In California, which also allows marijuana to be distributed for medical purposes, many dispensaries have become popular hangouts, he said, and that’s one reason California has run into problems with the federal government, which considers all marijuana use illegal. Your Dec. 19 editorial “Push back on medical pot,” in which you deny possible risk of federal prosecution and describe the citizens of Upper Freehold as uncompassionate, is inaccurate and misguided. News out of Colorado, a state regulated like New Jersey, indicates that letters were sent to dispensaries warning them that marijuana remains illegal under federal law. Translation: States, including New Jersey, cannot authorize violation of federal law. In states that register and track marijuana users and their conditions, combined statistics indicate very few are treating serious conditions such as cancer, glaucoma and HIV/AIDS. To suggest the vote denies relief to those on “death’s doorstep” is shameful. In reality, Upper Freehold is protecting its community from federal raids and large-scale marijuana operations.